I am now more than half-way through my spring break get-away to Branson, MO. For those of you not familiar with the Midwest, let me see if I can adequately explain Branson. It is the lights and shows of Las Vegas with the southern gospel values of Nashville. Branson is CLEAN living. There is no gambling – no bars (although the town is not dry by any stretch of the imagination) plenty of good, clean, country/western shows (with some hillybilly humor thrown in), LOTS of outlet shopping (3 outlet malls plus other various shops), and the Silver Dollar City theme park (somewhat of a cross between a pioneer town and 6 flags). It is spring break for most schools in the Midwest and let me tell you — this town is hopping! I did not come down here to partake in any of these entertainment festivities, however. We have a timeshare (purchased nearly 10 years ago) and I desperately needed to get away by myself. Being an introvert by nature, teaching is an energy draining profession. I absolutely LOVE educating our youth — but the constant pressure of being in front of a class wears me out after a while. That, coupled with my husband’s 3 month long unemployment and my mom’s recent brush with death (she was released from hospice the week before my husband lost his job) has left me with no emotional resources. This 5 day respite has been a perfect prescription. It is a short 4 hour drive from Kansas City – so I really feel as though I have “gotten away” without the travel expense. I left on Sunday morning and arrived around 2:00pm on Sunday afternoon. In this time period, I have finished reading Life of Pi, finished reading The Road, and finished grading all my papers for school — YIPPEE!! I feel that I have accomplished a lot and that I can go home fully relaxed and ready to begin classes again on Monday. I am not sure that I can adequately review these two books that I have read thus far. Both books are heavy reads – and I feel that their full impact will not be absorbed for quite some time. Life of Pi is an unbelievable story somehow portrayed in a very convincing manner. A young Indian boy survives 227 days on the Pacific Ocean on a 27 foot boat with a 450 pound Bengal tiger. Unbelievable, right? And yet the boy’s faith in God -albeit his God is a conglomeration of the “one” true God of Christians, Muslims, and Hindus – gives him a strength, determination, and endurance to survive despite impossible odds. The final pages of the book present the reader with another possible story – a more plausible story – and we are asked which one we believe. Our decision reveals more about us and our own faith than it does about this particular narrative. As I said, I am still mulling this over in my mind and have yet to form a comprehensible conclusion. I will say this, Yann Martel’s description of the Pacific Ocean — the fear of the unknown and the beauty of nature – is unsurpassed. I thoroughly enjoyed his word imagery and extended metaphors. The Road is depressing. Period. How many different ways can you describe hopelessness? I am awestruck by the author’s use of vocabulary to describe “black – gray – ashes”. There are numerous words I could add to Kathy’s Wondrous Words Wednesday meme from this book alone. Even though the past – present – and future were hopeless and full of despair, I was somehow drawn to finish the book. The bond between a father and son despite circumstances provided the necessary hope for the reader to persevere to the end — just like the characters. Again, it will take me quite some time to fully comprehend the full message of this story, but the author’s writing style — not only his incredible vocabulary, but his use of syntax to also create the mood of hopelessness is incredible. The author uses dialogue with no quotation marks – that seems significant to me. Like the words are spoken in silence – mimicking the barren land that surrounds them. Oftentimes the details are written as fragments – again, reflecting the fragmented world of this post-apocalyptic time period. I must say that I am very curious how my instructor for “Rewriting a Life” will use this book in class. I will be sure to pass along this information. I have also done some preparation for the final quarter of the year. My 7th graders will be doing a mystery unit and we will read some of the short stories of Sherlock Holmes. They will also try their hand at writing their own mysteries — inspired by the pictures of The Mysteries of Harris Burdiss by Chris Van Allsburg. I think I have selected the 3 or 4 Holmes’ mysteries for this unit of study. Do you have a favorite short mystery that you feel would work well in a 7th grade classroom? I would be most grateful for any suggestions. The 8th grade class will be learning Shakespeare by reading and (hopefully performing portions of….) Midsummer Night’s Dream. I know that I will learn how to better teach this class this summer, but for now, I am hoping that the play will be interesting enough to hold their attention and help them learn that the Bard is just as applicable today as he was 400 years ago. The 9th graders will complete Cyrano de Bergerac (thank you PBS for running the Broadway production of this over Christmas break and I can now show that in class) – and we will finish the year with Animal Farm. The British Literature class will complete Tale of Two Cities next week – give oral presentations of their British author which was researched and written in an 8-10 page paper, and finish the year by reading and discussing Tolkien’s, The Hobbit. I am now at a cross-road. What to do next? I have 1.5 days to do anything that I want to do — what a gift. I have decided that I do not want to read another heavy book — I will go home depressed rather than re-energized. I am thinking of reading The Help by Kathyrn Stockett or starting Drood by Dan Simmons. Ah — what a dilemma to be faced with! You certainly have had a full plate emotionally and mentally with your family. I am so glad you got the chance to get away for a bit of a breather. The Help is a wonderful book and the pages will just fly by. Enjoy the rest of your stay. I’m so glad you’re having some much need rest and relaxation. I didn’t like the ending of The Life of Pi, but I think I’m in the minority. Ah, Branson. I grew up in Kansas City (well, Overland Park, to be exact) and only made it to Branson once. Sounds like you’re having an enjoyable getaway. Of your 2 book choices, I’d definitely recommend The Help. It’s not exactly light, but not heavy, either, and it will leave you feeling uplifted and hopeful. It sounds like this week has been everything you needed it to be. I bought Life of Pi at a library book sale last year, but have been hesitant to start it. Your review is the first that’s really piqued my interest! I started The Road last year, but it was just too bleak for me at the time. I’ll get back to it one of these days. Both of those books are favorites of mine! I’ve never been to Branson, but my Wichita relatives sure talk about it a lot. 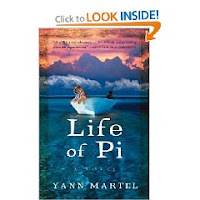 I enjoyed Life of Pi but it didn’t stick with me like I thought it would. Intersting. I’ve heard The Road is quite depressing. I still want to read it some day because it sounds like a powerful book all the same! 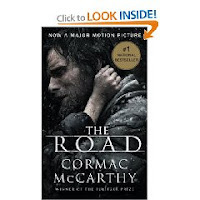 "The Road" was very bleak-I read it on a plane trip-my quick reaction is Mad Max meets Hemingway. "Life of Pi" I liked a lot. I first saw it in the Borders Book Store in Singapore, a huge place and supposed to be the most profitable per square foot Borders Store. I needed something to read and "Life of Pi" had won the Governor General's Prize for best novel so I bought it. I really enjoyed it and thing maybe what I liked best was the new perspective it gave me on zoo owners. It kept me interested to the end and I have joined a reading group starting August 1, 2009 to rereead it.